Italiensk Kulturforening i Stavanger - Movie and workshop with Luca Vullo: "La voce del corpo"
Movie and workshop with Luca Vullo: "La voce del corpo"
Stavanger Sølvberget Cinematek and the Italian Kulturforening i Stavanger (IKIS) are collaborating to host the Italian movie director Luca Vullo, for the screening of his documentary "La voce del corpo" (The Voice of the Body). This is a one-hour long movie, with English sub-titles, by Sicilian film Director, Luca Vullo. 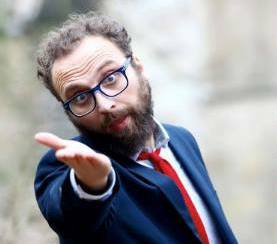 Luca will take us through a funny and informative journey featuring the typical body language for which the Sicilians are famous. Afterwards, an interactive workshop will be conducted by Luca Vullo himself. Italian snacks will be served, in addition to cakes and coffee. Entrance is NOK 150 (NOK 120 for IKIS members or with the Aftenbladkort).